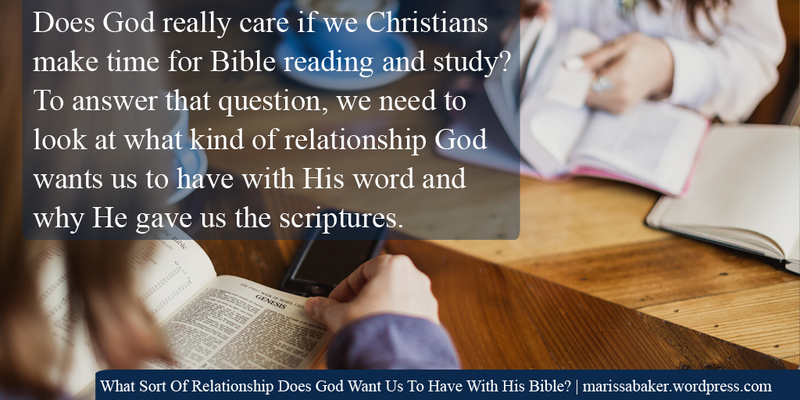 What Sort Of Relationship Does God Want Us To Have With His Bible? When we’re trying to become more like God there are typically four scriptural tools people talk about using: prayer, study, meditation, and fasting. Today, let’s take a closer look at studying. 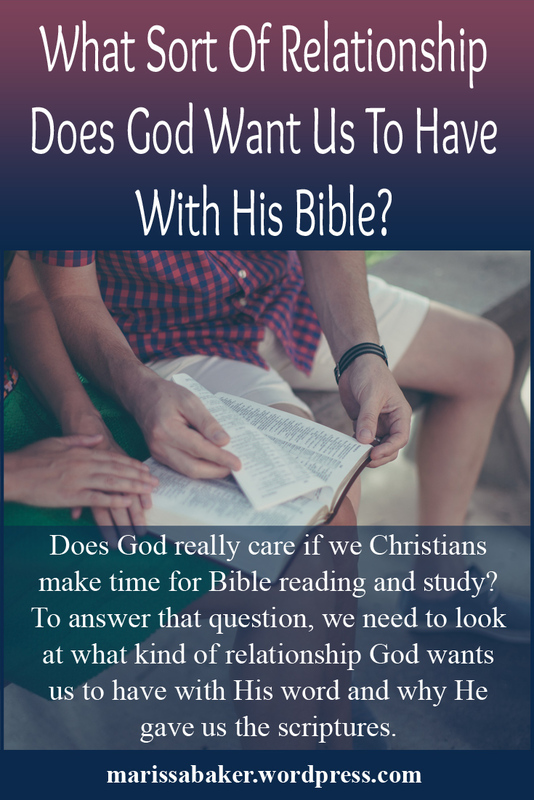 Even though I do study my Bible (as these blog posts will attest), I don’t think I’ve ever studied the topic of studying. So I ran a search for the word “study” in the New Testament and it didn’t show up in the WEB translation at all. The two uses in the KJV are both translated from different Greek words and neither means what we associate with the English word “study.” But just becasue that English word isn’t used much doesn’t mean the concept behind saying we should study God’s word isn’t correct. Miriam-Webster’s dictionary for students defines “study” as “the act of making an effort to learn by reading, practicing, or memorizing.” So I guess our question for today become whether or not that’s the sort of relationship God wants us to have with His word. We could pretty much end this blog post right here. If you want to become “wise for salvation through faith” and be “complete, thoroughly equipped for every good work” then you need to get to know God’s word. Paul makes it very clear that a person who is committed to following God needs to make themselves familiar with the Scriptures that we now call the Bible. This passage also establishes that scriptures comes straight from God, not human beings (see also 2 Pet. 1:19-21). As such, it’s profitable for us. These writings teach, reprove, correct, and instruct us in righteousness. And we need righteousness, becasue “the unrighteous will not inherit the kingdom of God” (1 cor. 6:9, WEB). Clearly, effort put toward learning, practicing, and memorizing God’s word is going to pay-off. And this isn’t the only scripture that says so. One of the big problems some people in Christ’s day had was with wrongly interpreting scripture. For example, He told the Sadducees that their error about the resurrection came from not knowing the scriptures nor the power of God (Matt. 22:29). Jesus put a high value on the scriptures, quoting from them, pointing people to them, and asking His listeners if they had read specific passages. John’s gospel records a conversation where Jesus told people who wanted to kill Him, “Search the scriptures; for in them ye think ye have eternal life: and they are they which testify of me” (John 5:39, KJV). Simply knowing the scriptures doesn’t give us life, but they do point us to the Life-Giver. And He consistently pointed us to the scriptures. It’s a cycle: you read the Bible, learn about Jesus, and He points you back to His and His Father’s words for more knowledge. When we’re studying the Bible and cultivating a real relationship with God, then He opens our minds to rightly understand the scripture and keep us out of dangerous errors (Luke 24:44-45; Eph. 1:16-21). The Bereans set a right example of how to interact with scripture. When Paul and Silas shared the gospel with them, “They accepted the message with all eagerness, examining the scriptures every day to see if these things were so” (Acts 17:11, LEB). They weren’t close-minded or in love with their own opinions. Rather, they spent time in the scriptures daily to make sure what they were hearing and believing lined-up with God’s revealed teachings. This point can’t be emphasized too much. Everything you accept as doctrine has to come out of the Bible. At the very least it must be implied by scripture and not contradict God’s word. No matter how good something sounds, if scripture doesn’t back it up then it’s not right. Paul and Peter both told us that scriptures don’t just come out of a human head; they’re actual words of God (2 Tim. 3:16; 2 Pet. 1:20-21). And if you twist and distort those words in the Old or New Testament, you’re heading for destruction (1 Pet. 3:16). Another reason why it’s important for us to know scripture is so that we can teach other people about God. We “ought to be teachers” (Heb. 5:12, KJV), and to do that well we need to be familiar with God’s word. You don’t get to decide what the gospel is. God has already done that, and so we need to know what He teaches before we share our faith. The book of Acts tells us about how teachers like Paul and Apollos used the scriptures to convince people that Jesus is the Messiah (Acts 17:2; 18:24-28). And throughout Paul’s writings, he quoted the Old Testament and the words of Jesus Christ to show that the letters he wrote are good teachings that line-up with what God says. And other writers did this as well (James 2:8; 4:5; 1 Pet. 2:6). If we can’t likewise show that we’re teaching from God’s word, then we have no business teaching. There are all sorts of good reasons to study the scriptures. They are important for teaching us about salvation, establishing sound doctrine, reproving and correcting faults, instructing us in righteousness, making us complete, and furnishing us for good works. Knowing scripture keeps us from falling into errors and equips us as good teachers. Scripture also encourages us and gives us hope. The Bible is the most consistent way God talks to us. If you want to know what He thinks about something, you go to His word and pray that He’ll teach you from it. If you want a deeper relationship with God, you read the Book where He reveals His mind and purpose. This emphasis on Bible reading for drawing closer to God is not at all meant to down-play the role of Jesus Christ as our Savior or of the holy spirit, which God uses to transform us so we can become like Him. What I’m saying is that the Bible just keeps becoming more and more important and meaningful the more the Father and Jesus work in us to open our minds and change our hearts. We’ll never get to the point where the Bible isn’t something we need to study because it’s one of the main things God uses to teach us about Himself. And there’s always more to learn about and from Him.